SIGN UP BY SUNDAY, APRIL 21 for the Saturday, April 27, build date here or email Katie and Tracy Jewell with the following information. Number of people attending, including yourself? Do you need a ride to the border? Are you willing to give others a ride to the U.S. side of the border? If yes, how many people (besides yourself) can you drive? We will leave the Good Sam/Newman parking lot no later than 7:00am and return approximately by 4:00pm-5:00pm (depends on the border crossing time). If you are able, a $10-$25 donation is requested by Build a Miracle (BAM) to cover the cost of the bus and lunch. Katie and Tracy Jewell will send detailed information as soon as it is received from BAM, usually a couple days before the build date. Purchase an item off the Gift Registry to help furnish the newly built Build a Miracle home. Please purchase items no later than April 15. You can bring the items to Build a Miracle on April 27, leave them at the church office, or ship them to Attn Tracy Jewell, 10161 Rookwood Drive, San Diego, CA 92131. For more information email Katie or Tracy Jewell or call (858) 695-9967. Sign-Up Deadline: Please sign-up at least one week prior to the build date. Age and Skill Level: All ages and skill levels welcome. Adults U.S. Citizens now need a Passport to cross back into the USA. However, unofficially if you are a U.S. citizen and have a drivers license AND a birth certificate, they will let you through – might have to wait while they check your ID/docs (apparently people still do it this way, though it is not recommended). Children under 16 without a passport can present an original or copy of their birth certificate. Build a Miracle is a non-profit organization that raises funds and builds homes for needy families in Tijuana, Mexico. These families cobble together shelters made from discarded wood, tarps, and other scrap objects. Often, their toilets and kitchens are outdoors and unsanitary. Children share beds and entire families live in a single room with a dirt floor. 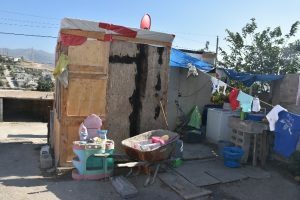 Through the efforts of Build a Miracle, and sponsors like Good Samaritan and the Newman Center at UCSD, hundreds have been rescued from these living conditions. The process of building a home starts with our volunteers mixing concrete to pour the pads. Then skilled workers add electrical, plumbing, and the roof. Then our volunteers install the insulation, metal lathe, drywall, and paint. The program is set up so that people of any age or skill level can experience the joy of helping others. There will be three different build dates, see above. You can sign-up for one or all build dates up to one week prior to the build date. Get more information about Build a Miracle and their programs. Donations can be made to Good Samaritan Episcopal Church with Build a Miracle in the memo line.